Syrian forces resumed their bombardment of the city of Homs Monday after Arab countries called for U.N. peacekeepers and pledged their firm support for the opposition battling President Bashar al-Assad. 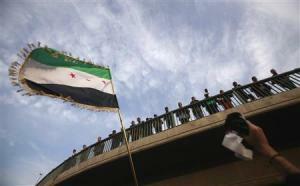 Syria opposition are plain Islamists, supported by Al-Queda and the likes. Qatar supplies the rebels with money, and looks like this is a part of the current campaign to overturn all secular dictators and replace them with religious fanatics. No support from me for these tasks. I hope Arab league will come up with a resolution soon to stop this atrocity!!! I think we've all got the picture now. Words are not going to get the job done here. Assad clearly couldn't care less about empty rhetoric. Right from the first sentence -the UN human rights chief blamed.....Whenever I read those two letters, my back arches.